Nice, cosy and super clean. The stuff is very friendly, everything is easy at Shanti. Confortable bed with individual curtains, light and plugs. Very nice decoration and very nice atmosphere. 100% recommendable! Stayed at the hostel for two nights and it was incredible! On the first night, I arrived at like 2 AM and they recieved me with open arms, which I appreciated a lot Hostel facilities are perfect, the bathroom and the kitchen were really clean and more than enough for daily use! The staff was INCREDIBLY nice Specially Peter, he tried to make a really good environment, and explained a lot of useful stuff for Skopje The best was the common place, which make it really easy to make friends!!! I only stayed one night but I had a great time . 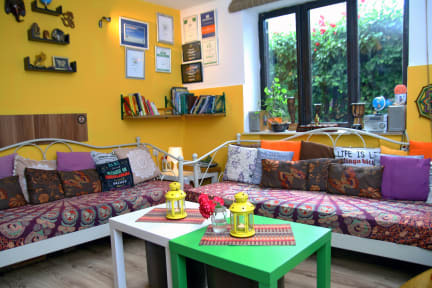 The hostel is small and cozy but there is enough space for everyone there . The staff is super friendly and they make a great ambiance for the guests, specially if you travel alone. I will definitely stay again there. Great Hostel! 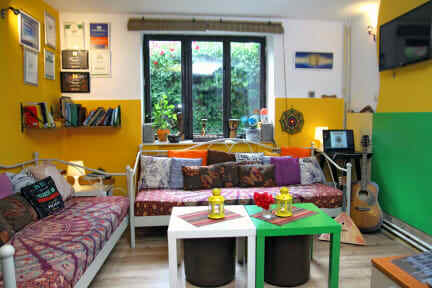 It's aiready many years that I stay in hostels from Hostelworld and Shanti Hostel was an excellent choice. 5 minutes walk from the bus station and 5-10 minutes walk to downtown, the hostel it's in a great locación. The staff is very friendly and very helpfull, this is what I most apreciate when I stay in a hostel. The facilites are also very good and the terrace very nice to relax after visiting the city. I hope I can visit soon again Macedonia and Shanti Hodtel! Buen hostal, decorado con gusto, acogedor, tranquilo. Buen precio y buena ubicación. Good hostel. The best thing the reception people, they were nice and friendly. The hostel is 10/15min by walk to the city centre but the walk is nice aswell. I would repeat. Hostel normal, situado cerca de la estación y a 10 minutos del centro. El personal agradable. El desayuno simple. Baños y habitaciones limpias. El hostel está muy bien, te facilitan muchas cosas y el desayuno es completo. Maki, el recepcionista es muy buena onda. Es incómodo que los recepcionistas estén durmiendo en el living (o sea que si queres estar de noche ahí se complica) y que el desayuno sea tan tarde. Imaginate que si te tenes que ir temprano no tenes desayuno y no podes usar el living. Ah, y no hay baños en el primer piso. O sea, es un hostel aceptable pero esperaba más por su reputación.